A Practical Guide to Preserving, Protecting and Beautifying Your Asphalt Parking Lot Utilizing a Well Planned Systematic Program of Crack Filling, Asphalt Repair and Sealcoating. Your parking lot is the “Welcome Mat” to your property. It provides both image and functionality to your business or institution. Your parking lot represents capital investment that must be maintained. 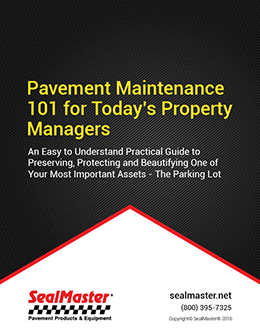 Download this FREE white paper to learn the basics of pavement maintenance and what you need know to assure a successful pavement preservation and beautification program. Gain valuable insights from the industry experts at SealMaster.